All Munzee Madness products are sold through our eBay store. Clicking on the "buy now" button will take you to the eBay page. One each: Diamond, Pink Diamond, Topaz, Aquamarine and Ruby. Add some Sparkle to your neighborhood. 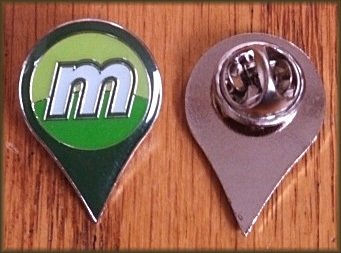 Here's a nifty little Munzee Logo Lapel Pin. Looks great on a shirt collar, jacket lapel, baseball cap, munzee hat, t-shirt, anywhere you can think of. Show off your Munzee Pride. They measure roughly 3/4" wide and 1" tall. Buy a couple and give one away. Send one to me! 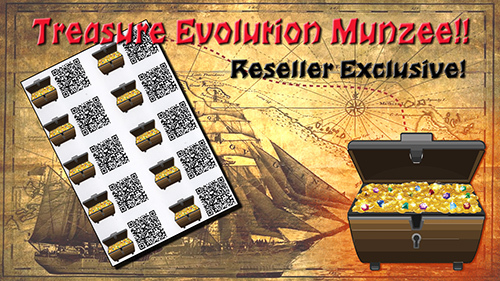 Munzee - Treasure Evolution Stickers! Sheet of 10 - Reseller Exclusive! 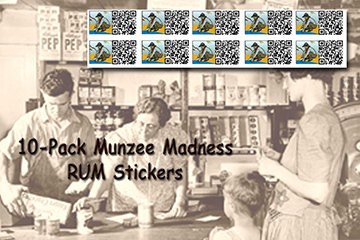 TEN - Treasure Evolution Munzee Stickers! Gold Coin --> Bag of Gold Coins --> Treasure Chest! FREE exclusive Extras included with every order! Buy with confidence from the original Munzee Reseller! WallaBee Personal Munzee Dog Tag!! 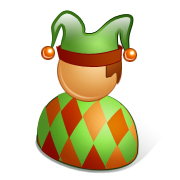 Combining two great games, WallaBee and Munzee! 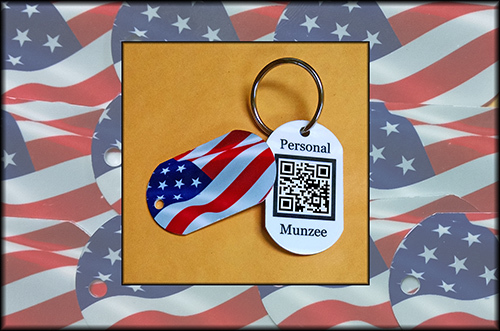 Newest Personal Munzee Dog Tag in the store. Great graphic of Old Glory waving in the breeze. 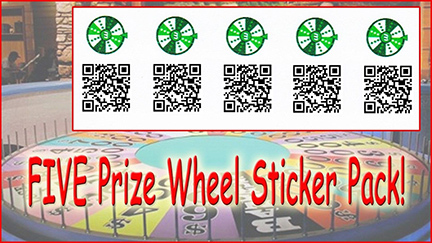 5-Pack of Prize Wheel Munzees! 25 points to the deployer, 25 points to the deployer each time it's captured. And the capper gets the surprise points! 10, 20, 40, 60, 80 or 100 points! 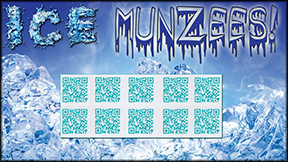 Munzee Ice Munzee 10 Pack Stickers Chilly! The new kid on the ice block. 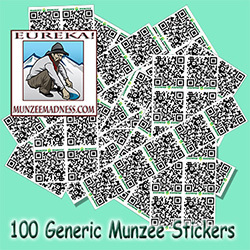 10 Official Munzee Madness Reseller Unique Stickers! Available ONLY from Munzee Madness!! How do they work and what are the points? 60 points split between the Capper and the Owner!!! When captured, the Fire Mystery lights three fires within 1 mile on greenies. These will burn for two hours or until capped. 1. There is an 80% chance that the fire will extinguish. For putting out the fire, the capper will receive 50 points and the owner of the host greenie will earn 10 points. 2. The other 20% is a little more dangerous. These fires can also burn you. If you get burned, you will LOSE 5 points. The owner of the host greenie will still earn 10 points. 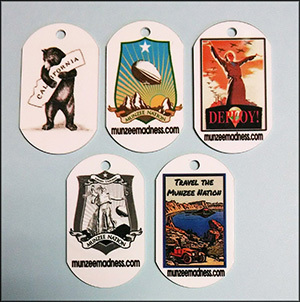 This Personal Munzee is an aluminum Dog Tag style Munzee. It comes with a 20mm split ring so it can be attached to just about anything. The personal munzee is similar to a social munzee, however it yields points and is tied to actual coordinates. The owner of a personal munzee is able to deploy up to 3 times per day in new locations by scanning the munzee where they would like it deployed. Once deployed the munzee is able to be captured up to one mile away. This allows a player to create a nametag, deploy at an event, then walk around the local area freely while still being able to be captured. A personal munzee may not be deployed more than 3 times per day, even with assistance from MHQ, so be careful. The personal munzee is exempt from proximity rules so it is able to be deployed at an event or in the middle of virtual fields, ANYWHERE you may meet another player and want to share your code. You can always use the code of your personal munzee for other ideas as well, be creative! The new Munzee on the block! Brand new and ready to deploy! Buy with confidence from Munzee Madness, the first authorized Reseller! 20 White Regular size (7/8") Munzees. That's 49 Munzees! But wait, there's more! 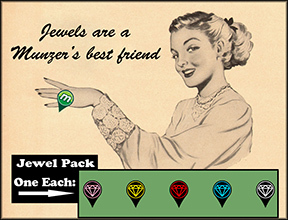 We'll throw in one extra Mini-Mystery Munzee for free! A total of 50 brand spanking new Munzees, ready for you to deploy. And of course, there's always free goodies included with every order! The Chief! New design Personal Munzee. Metal Dog Tag! Premium Item! Hurts My Eyes! 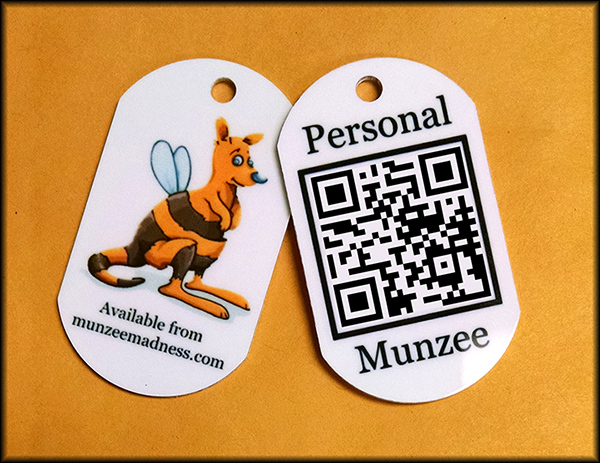 New design Personal Munzee Metal Dog Tag! This is a ten pack of Aquamarine Stickers. Brand new physical sticker, just released. This is a five pack of DIAMONDs. This is a five pack of RUBIES. Contains TEN pre-coded and ready to deploy MOTEL Munzees! With 5 Rooms to Grow! These are the NEW smaller size. Contains FIVE pre-coded and ready to deploy HOTEL Munzees! With 10 Rooms to Grow! This Personal Munzee is a Leather Key Chain Fob style Munzee. It has a nice feel to it, a large ring for keys and the QR code and artwork is under plastic so it won't get scratched or abused. 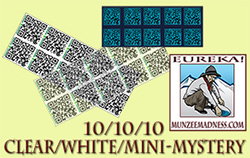 Offered here for sale is a lot of 100 WHITE vinyl Generic Munzee QR Code Stickers. These are the NEWEST size and will prove to be the standard. 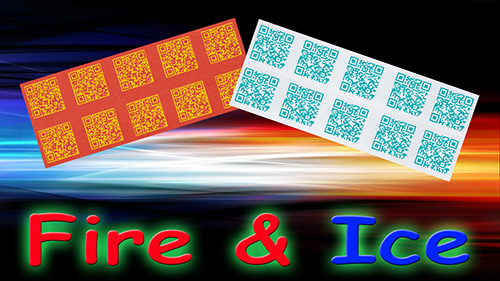 The QR code measures approximately 7/8" square. I think this is the perfect size for almost any deploy situation. These Munzee Stickers are made of high quality, WHITE vinyl with a thin laminate layer that makes them weatherproof. Being printed on WHITE vinyl, they stand out well on any color surface and make for an easy scan. Buy one of these and I'll toss in a FREE Mystery Munzee! Be sure to ask for it in your paypal payment.